In government I believe it’s time to go big on design. The same is true for many other sectors and industries. That needs to start with design leadership. Does your organisation have design leadership? I want everyone to think about this question. If you want to be taken seriously at doing user-centred design then you need design leadership. Every organisation needs someone that can drive the change that ultimately delivers better products for people. It’s about taking real responsibility for how well things work. In my opinion the people that get hold of this will be the organisations that build great products that are part of great services. Just to be clear. Design-led thinking doesn’t exclude technology. Instead, it uses technology as an accelerator. A way of delivering ideas and information to more people, more of the time. The problem. So many companies are still technology-led. They focus on stand-alone ‘innovation’ before people. If you’re a large organisation then I think that your best chance is to be design-led. We’re seeing a rise of design-led companies. Companies like Apple have put an emphasis on products that are well designed, or that work well for people. We’re seeing companies that really understand the importance of good design and that user experience is a competitive advantage. People are willing to pay these companies for good design. The best tech startups definitely get this. They speak directly to end-users. This is a great quote from a design week roundtable earlier this year, asking: Will the most successful tech companies of the future be design-led? The truth is large organisations, like the civil service, become orientated around themselves not end-users. The emphasis has to be on large organisations to change. As I’ve written about before, changing how an organisation thinks and operates is hard. It takes time and these things are deeply embedded in the culture of how we work. Design has to earn the right to exist in large organisations. If you need to start somewhere then start with showing that it can add value. In government I call this fixing the broken windows. In my experience organisations suffer because they have all the skills but none of the connectivity to get user-centred design right. There just isn’t enough collaboration and sharing. Designers. Designing end-to-end user journeys for a service, across digital and other channels. Designing each user interaction as part of a service. User researchers. Understanding the problem. Making sure teams continuously learn about users as part of an iterative design process. Content designers. Responsible for all the content in a service. Making sure appropriate content is shown to users at the right place and in the best format. Front-end developers. The link between people and technology. Testing solutions with end-users through to production ready code. A strong focus on accessibility. Data scientists. Supporting discovery with evidence. Enabling data and hypothesis-driven design to improve live services. I firmly believe that you need design leadership to bring all these specialisms together if you’re going to deliver better products and services. You need someone to bring them together in order to put design at the heart of the organisation. It’s their job to make sure that everyone is working to solve the problem together. It’s important that when one area fails they all have someone to set direction. Setting standards and making sure that users always come first. Going back 12 years to one of my first jobs working in UK higher education, the college website we were responsible for got stuck between the IT department and the marketing department. As it happens, I tried back then to create a digital team that sat somewhere else and failed. Not much has changed for many organisations I’ve worked with since then. It’s just hard to agree issues of ownership. But multi-layered reporting, middle managers, and silos between multiple disciplines reduce the chance of delivering the best possible products and services. Design leadership can provide the missing link between what the organisation is doing and what senior management know. At best it should be a direct reporting line. As well as bringing together specialist roles design leadership also works to break down the organisation silos we’ve talked about. This is more than the ownership of ‘digital’. It should go much wider to include all the data, communications, and content within an organisation. Whatever your organisation looks like, design leadership and moving towards a design-led way of thinking has the potential to break how you work. Remodelling your organisation or product teams around design might require new funding models. You will find that cross-cutting design principles don’t always fit easily with existing organisational structures. For example, in government there’s the added challenge of organisational goals or objectives being aligned to generalists, not specialists. These are big significant changes if we’re going to design better products and services. Finally, strong design leadership in any organisation should start to break down the culture of certainty and any over-reliance on evidence. This shift in culture values starting and a learning mindset – moving people to the idea that starting outweighs evidence. Always. Design leadership needs to understand that managing is as important as leadership. As I’ve written recently – managing is something you have to be deliberate with, and think about. Design leadership isn’t about replacing management, it’s about designing better systems and ways of managing. The reality in a product environment is that you need design leadership to position the umbrella. This means working closely alongside delivery managers and the people that own your products and services. It’s about managing everything that happens around other people so they can do their best possible work. The best possible work that your organisation so desperately needs to happen in order to succeed. Most organisations are at a crossroads. Like many other people, I only want to work for organisations that are willing to go big on design leadership. It’s not negotiable because it’s the only way that we’re going to deliver great products and services. My advice to designers. Don’t waste too much of your time working for companies that don’t take design seriously. Ultimately, these organisations are likely to fail, or you will be responsible for the delivery of broken products and services. The challenge is to keep pushing hard where you are right now. Don’t accept siloed working or a workplace without creative collaboration. It’s what I now like to call go big or go home. That’s what design leadership is all about. 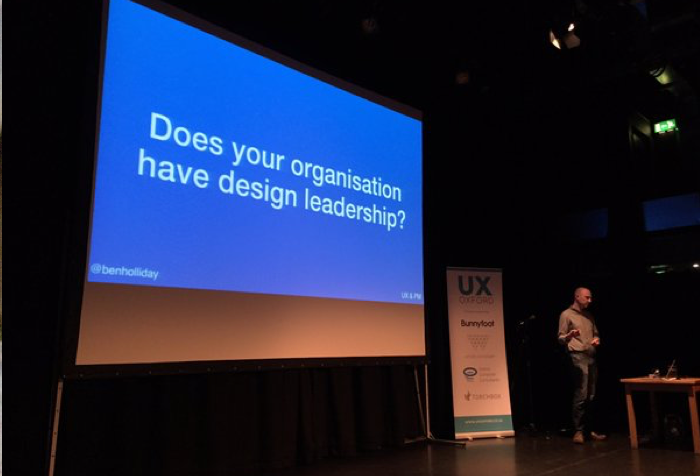 The basis of the post is taken from the talk I gave at UX Oxford (the slides are here). I’ll be revisiting and expanding on some of these ideas at Glug Reading in July – tickets and more information.